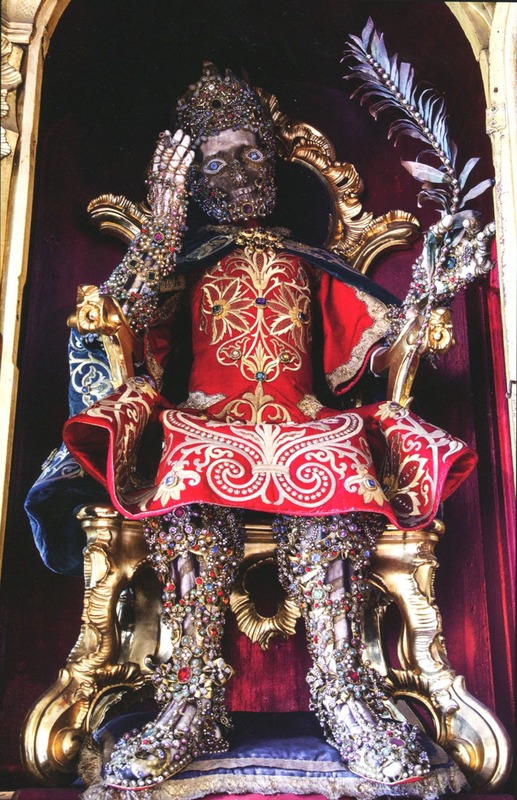 The adorned remains of Saint Felix, once of the parish of Tafers, Switzerland now on exhibit at the Museum of Art and History in Fribourg. A remarkable amount of my life has revolved around bones, both recent and fossil. I have cleaned them, excavated them, scrambled across rocky landscapes under the blazing desert sun looking for them, mused and mulled over them, measured them, photographed them, x-rayed them, CT scanned them, preserved them, conserved them, cursed them, praised them, read about them, written about them, molded them, cast them, put them on exhibit, accumulated well in excess of 10,000 books, scientific papers, and pdfs about them, and discussed them with students and colleagues across the globe. Many people I know have done the same - it’s par for the course for vertebrate paleontologists. Given that experience, one might become jaded about bones, but that hasn’t happened to me yet. I still find bones of great interest and am challenged by the story they tell us about the evolution and biology of life on Earth. However, I recently read two books that, in spite of my many decades of working with vertebrate fossils, revealed to me a new and wonderful story about bones, this time about the human skeleton. The Empire of Death: A Cultural History of Ossuaries and Charnel Houses and Heavenly Bodies: Cult Treasures and Spectacular Saints from the Catacombs are by Paul Koudounaris, who holds a PhD in Art History from UCLA and so has a scholar’s interest and knowledge of his subject matter. He visited over 70 sites on four continents while researching these books. In addition to his keen intellect, Dr. Koudounaris possesses the all too rare ability to write about technical subjects in an engaging, easy to understand style that keeps the reader interested without sacrificing accuracy or the deeper meaning of what he writes about. On top of that, the books are lavishly illustrated with hundreds of spectacular photographs that are even more riveting than the text. So when you finish these books you not only come away with a skull crammed full of new details but you will want to immediately turn back to the first page and start again. These are not books you only read once. You will reread them and share them with friends and family, although how they will react is another matter. 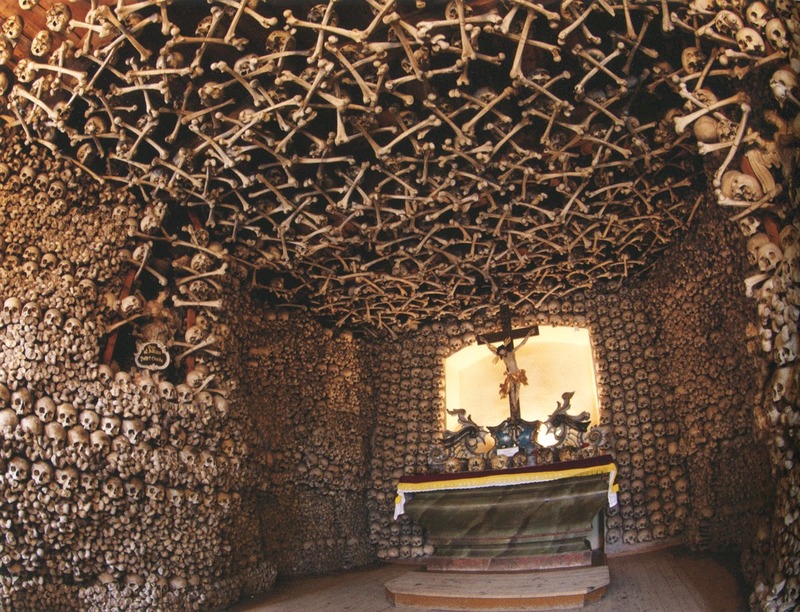 Although this is known as The Chapel of Skulls in Czermna, Poland, the ceiling is made of lashed together human thigh bones. I’ll just give the briefest outlines of what the books are about and show a few images. If you find this of any interest whatsoever, track down these volumes – you will not be disappointed. Take the world tour via the printed page and remember that a number of these sites are open to the public. Someday you might be in the neighborhood and can pay a visit. The Chapel of Bones (and indeed it is), Parish Church of Nossa Senhora da Expectacao, Campo Maior, Portugal. The Empire of Death explores our changing familarity with the skeletal remains of dead. In the not too distant past, interacting with the bones of the dead was an important part of Christian spiritual life. Bones were amassed, sometimes in staggering numbers. The Paris Catacombs contain the remains of as many as 10,000,000 Parisians, with vast walls piled up by type of bone, sometimes with skulls arranged to spell out Latin phrases. 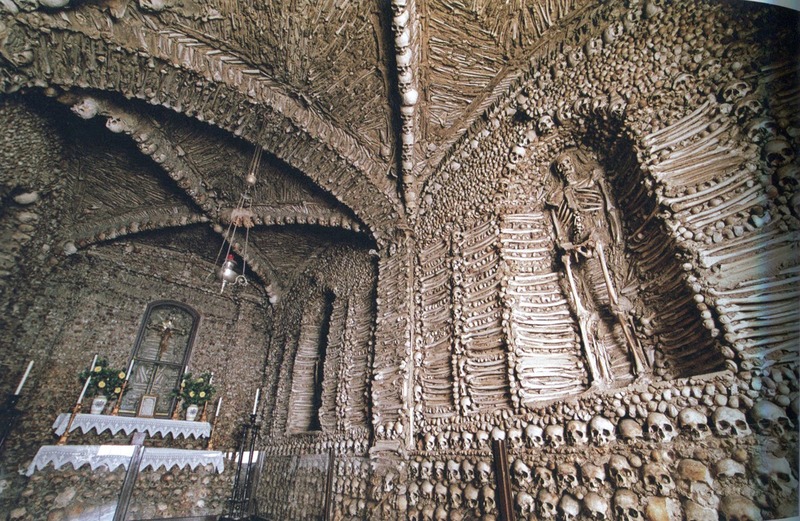 In other cases, tens of thousands of bones literally line the walls and hang from the ceilings of chapels. 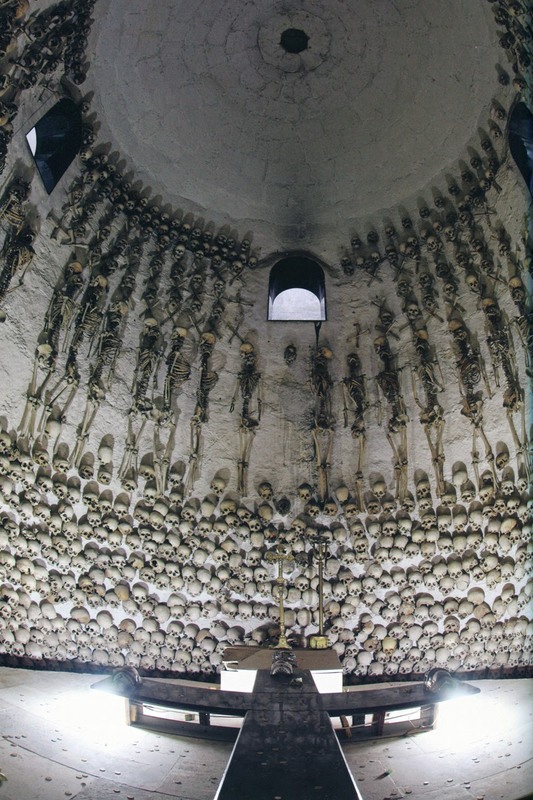 Full skeletons were dressed up in robes, armor, vestments, and other clothing. Tomb of Enrique Torres Belon, Church of Sanitago Apostol, Lima, Peru. These sites were seen as sacred and worshippers went to them to solicit aid from the dead. Unlike today, people were not repulsed by the dead but instead saw them as a source of help and hope. As can be seen in the photographs in The Empire of Death, a number of these churches still have magnificent remains in-place. 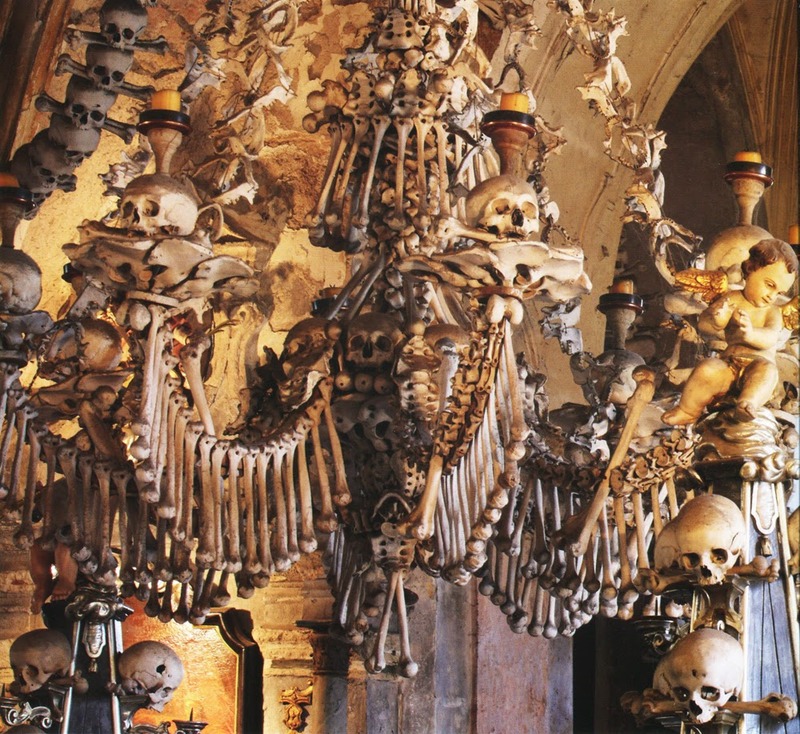 The remarkable 8 foot wide chandelier is made of human skulls, limb bones, and pelves, All Saint’s Chapel, Sedlec, Czech Republic. 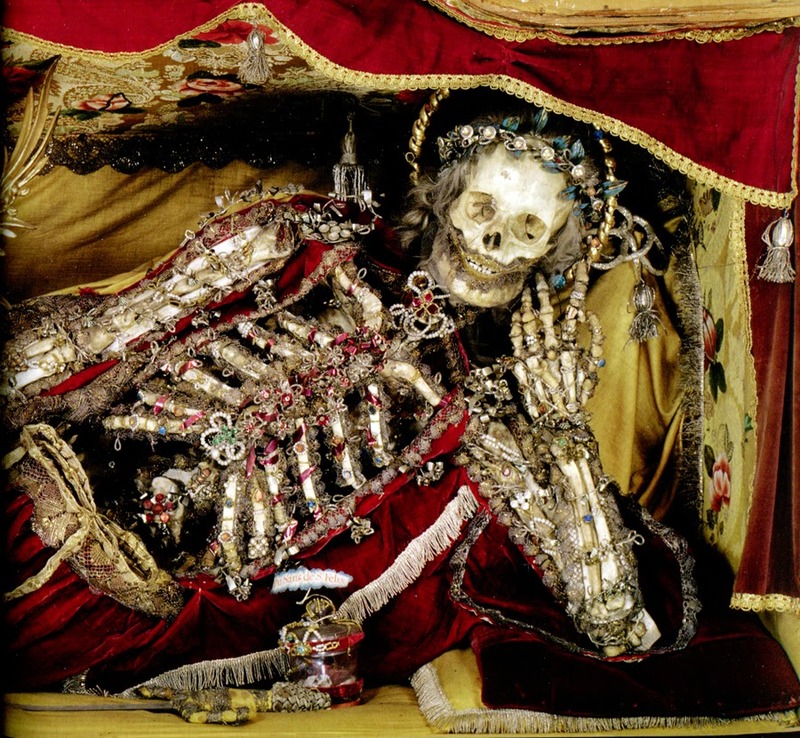 Heavenly Bodies traces the strange history of skeletons from the Roman catacombs. During the battles of the Protestant Reformation in 16th century northern Europe, many Catholic churches were sacked and their religious reliquaries and holy objects wantonly destroyed as non-Christian. As part of its counter reformation, the Catholic church sought to re-establish itself in those areas and replace the holy objects that had been lost. But where to get so many saintly objects in such a short time? From the Roman catacombs of course, where first century corpses were in abundance (although many of them were of pagans). With little or no information about the bodies, church officials, including the Pope simply declared them saints, sometimes en mass, gave them names, sold them to distant churches, and shipped them off. The dressed and bejeweled skeleton of Saint Felix, Gars am Inn, Germany. They were received with great fanfare and proudly and prominently exhibited in churches. To better honor these holy relics, nuns, at great expense, sewed clothing for the corpses/skeletons and often festooned them with colored glass, gold, and precious jewels. Saint Gratian in Waldassen, Germany dressed in sumptuous Roman military attire. 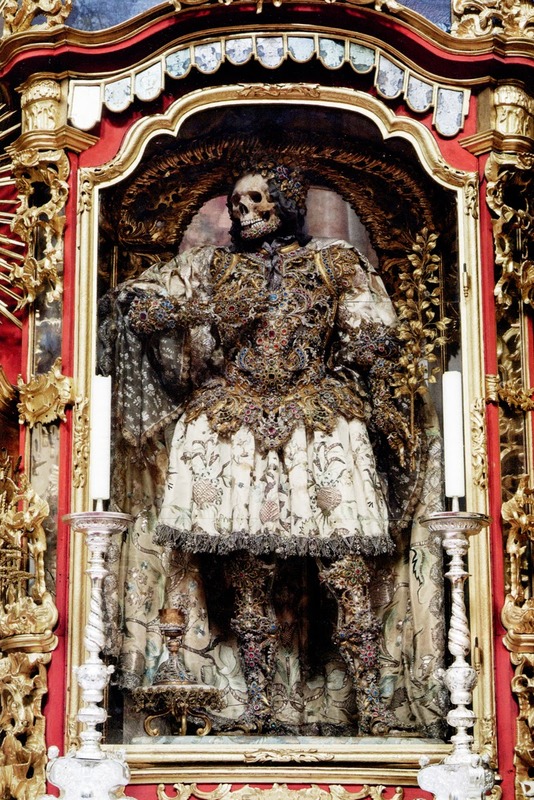 These “catacomb saints” remained powerful religious emblems and objects of adoration in the churches until the late 18th and early 19th century, when they began to be seen as too ghoulish or idolatrous to remain there. Many were destroyed or removed and put in storage. Some are still in public areas. 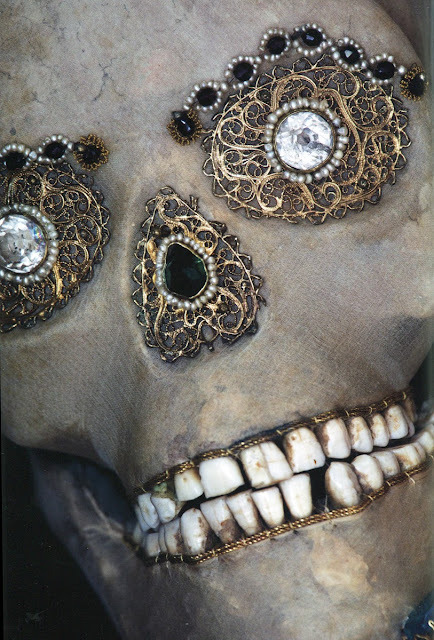 Regardless of your visceral reaction to the outlandishly decorated skeletons, one cannot deny the beauty of the sewing and wirework, the attention to detail, and the ornate jewelry worked into the clothing and sometimes the bone itself. Fine eye, nose, and dental wirework on Saint Benedictus, Hergiswil, Switzerland. 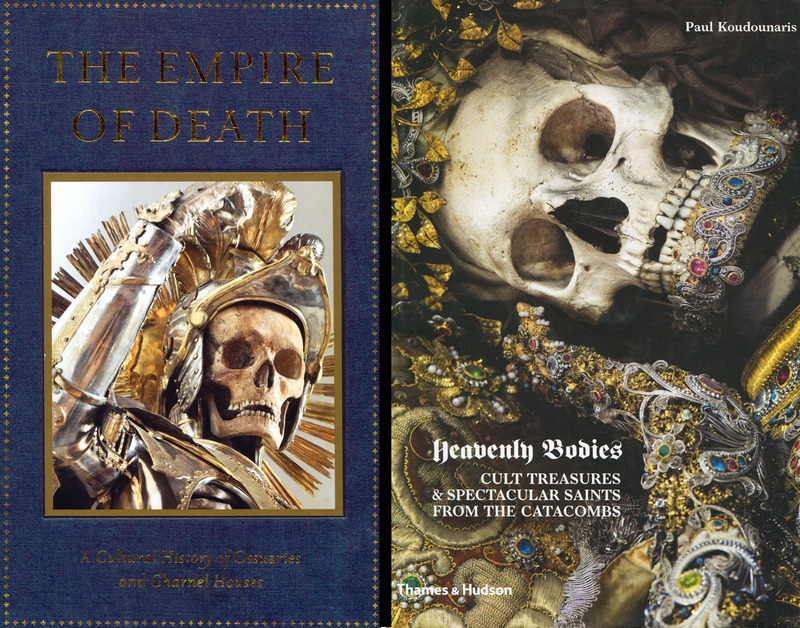 Paul Koudounaris' personal website www.empiredelamort.com is, as he states “an online resource for charnel houses and burial catacombs, and a supplement to the book The Empire of Death”. It contains spectacular photos and information on even more sites than are in his books. It is well worth a visit. I created a database of granite, rock, sand and gravel quarry. Welcome!